Not a thing was left undecorated, not even the mouse. but my quilting friend’s stocking still remained bare. The 12 Moda Days of Christmas made it perfectly clear! her stocking will be FABULOUS, she’s sure to adore! 2. Leave a COMMENT on the blog as to why you want Santa to bring you the Stocking Stuffer of the day! Let’s go baby! I would love to have one of these. Need some inspiration this year! Thanks…lovely way to get ready for the holidays. Sounds like fun and prizes in the winter!!!! What fun it would be, to find this “Go Baby” under mt Christmas tree! This would be a great addition to my purchase of the “GO” system at the quilt festival this year. Just think of what I could make this year if I am the winner. Great stuff! 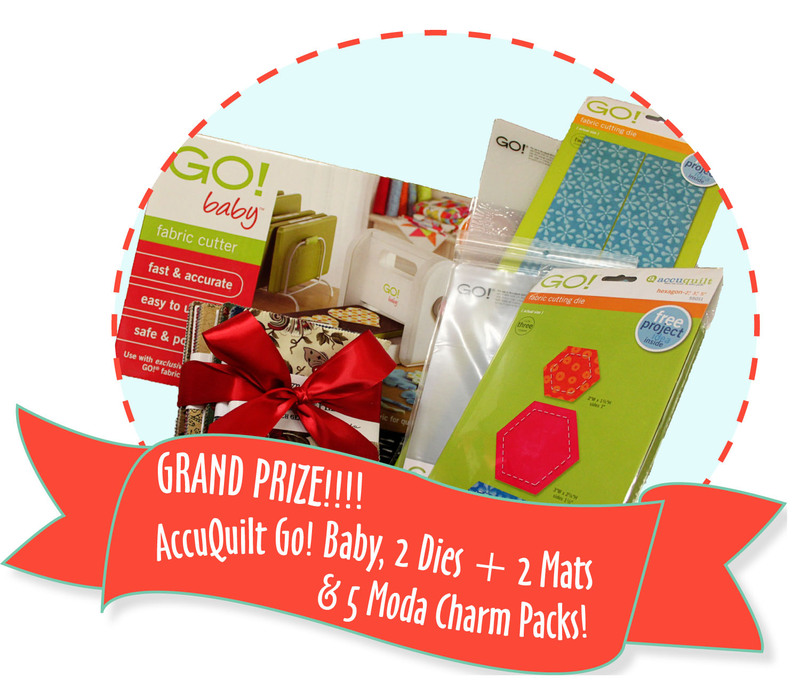 Great giveaway.It would make any quilters day to win. I need some creative ideas for my small quilting group, so I will be anxious to see what you have. Awesome giveaway! The GO dies are so much fun to use. Sound like a wonderful idea! Thanks for the give-away chance. Oh wow what a great contest and prize. It would be SO fun to win this, because it is on my Christmas list! I am losing my vision due to toxoplasmosis. Cutting fabric is almost impossible for me to accomplish independently. An AccuQuilt cutting machine would restore this vital function for me! I keep reading about these machines. What a merry Christmas present! Thanks for the opportunity! What a good way to enjoy the countdown. Thanks for the giveaway, what a great Christmas present if I win!!! I should receive your stocking stuffers because I’m a new quilter in my honeymoon year and I can use some great products so I can make some gorgeous quilts! 🙂 Merry Christmas! Thanks for the wonderful blog by the way! I am a follower! I would like Santa to bring me the stocking stuffer of the day because they are the fun part of Christmas for me, surprises!! I would love to have the stocking stuffer of the day because one can never have to much quilting stuff. What an awesome time of the year! Ideas and prizes, how can one lose. I’m a new follower! Why do I want to win? One can NEVER have too much stash…. we all want to win! lol Thanks for the chance and I will be checking daily – thanks!! Awesome grand prize! I’m right there with everyone else wishing I had a Go! Baby!!! Can’t wait to see the stocking stuffing ideas. Hi – I’m a follower. I would love to fill my stocking with something that makes me happy! Much better than socks and undies! I would love to have this. I am a follower of your blog. Santa should leave me this because I’ve been veryyyyy good. Good ideas. I am excited for the ideas. I’ve seen sew many magazine and online ads for the ‘Go Baby’ and would have such a merry Christmas if I won! Thanks for the chance and the stocking stuffer ideas too. 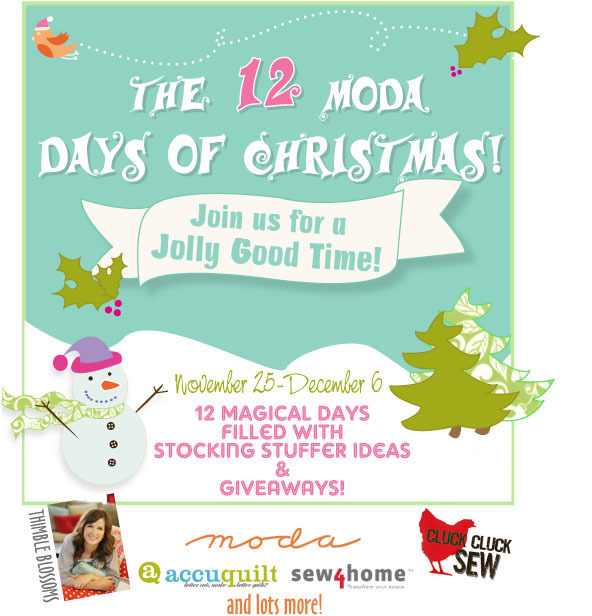 Looking forward to the 12 days of Moda Christmas! Lol I mean 30 years. So excited! Long time fan and follower and look forward to each of the twelve days…. I can’t wait to check this blog every day! I’m a sucker for deals of the day! OMGosh what an awesome giveaway. I could see fun times ahead if I won this!! I am new to quilting and this would be a nice way to start. Oh what fun. This is such a great idea!!! I would love to win the stocking stuffers and would LOVE to win the grand prize too!!!! The time I would save with it!!! What a great giveaway from my fav moda! I am new ti quilting and am starting a new etsy shop. I would also like to make mini quilts for NICU babies. I have had 2 and would like to give the families something handmade to soften the clinical environment. I make quilts for Cancer patients and would love to win some stocking stuffers to help me be able to do more. This will be fun! Although I never win but I can try. in hopes of winning the prize! WOW! This looks like a fun 12 days! Oh WOW! What a great giveaway!! I love Moda and all their designers so goodies would definitely help inspire my next project! Oh, how great would it be to win such a great prize-WOW!! I am a retired Grandmother and just back into quilting, What a great treat to win something so sweet. Oh wow, would love to win some Moda goodies! Thanks for the chance. How fun!!!! This is my favorite time of year making gifts for people I love! Love to win some treats for Christmas!! I’ve been R-E-A-L-L-Y, really good all year long (OK, mostly good…I AM only human) & deserving a stocking stuffer from Santa! These pleasures would certainly keep me quiet and busy!! We can always use goodies to make the quilts of valor. What a great way to get the holidays started! What a wonderful give away! Love it!!! Big girls need their toys, too! Oh..Baby! Wouldn’t I love to find you in my stocking! I will definately have to get a bigger one. Thanks!!! I am following the blog via email. I would LOVE to win that Go Baby cutter! Thanks for the giveaway! What a wonderful way to start the holiday season! Thanks for the opportunity! Ooooh I would love to win! Anything Moda and Accuquilt in my stocking please! I would love to win the AccuCut Go! This would really fit in my stocking! Fun! Just recently started sewing/crafting again and found out about your products. I would love to win and jumpstart my project to-do list! good luck to all! What a great Christmas present! I just love the Half Moon Modern collection! Lovely colours. This charity quilter sure could use this wonderful gift! Thank you! I would love to have this!! Imagine all the pretty gifts I could make! I’ve been wanting a GO. me, me, me…. I need this so much! I would love Santa to send this my way as its been a tight year financially and I could use the fabric to make gifts. Please pick me!! I would LOVE to win since I never get any sewing ‘stuff’ for Christmas. I would love to win sewing stuff! I am a beginner and need all the quilting gadgets I can get! Thanks Moda! I would SO love to win some sewing treats! I’ve been drooling over the GO family and really love the line of fabrics in this week’s Sew4Home projects! Can’t wait for gift ideas! I love stocking stuffers! Especially of the sewing variety! And, a Go Baby would be awesome! I would love for Santa to leave me the Stocking Stuffer, it has been a while since i got a stocking filled with Goodies and it would be so fun to dump it out and see all the neat Moda/United notion sewing goodies to have fun with! I could never have enough sewing gadgets or fabric! I’m just starting to quilt, so this would be a terrific help getting started! Something new can be such a jump start to inspiration. Cutest Stockings I have seen…..and I have been looking. I am planning to make small stockings to put next to dinner plates at Christmas Dinner. Please may I have a pattern. Thank you. Great fabric – would love to win! Oh this is fab! I would love to make quilting easier for my mommy! What a great prize giveaway for this Christmas Holiday! This would be such a great item to add to my sewing. Thanks for the chance to win. Have really been enjoying each day’s posts on FB and reading some of the blogs…of course, that means I am on the computer instead of in my sewing room stitching up those gifts I vowed to do this year. Love all the blogs and would love a chance to win. Thanks. What a great Christmas gift this would make! Thanks for the chance. Would love to have this under my tree! I love gadgets and have wanted a go cutter for a while. I’d love to win one! how? have I NOT found this website before??? I am a follower now!!! Just found your blog, I will keep my eyes here for sure! I am already a follower so count me in! Santa’s so generous I know he would help out this busy quilter with a few helpful tools! This is just the kit I need to jump start my holiday craft bonanza! An accuquilt would make my sewing so much easier ~ would love to find it in my stocking! Would just love it…and dreams can come true for me….. Sounds like fun, awesome giveaway! Would love to find this under the tree. I’m dreaming of all the recipes I can whip up this year! Awesome giveaway! Thank you for the chance to win Moda! Fingers crossed that I might win! I think it would be really cool to win these goodies, though if you look at the reasons given rather than draw randomly, there are others who really ought to get the goodies. Would love to win – I’m now a follower and will be checking back on a regular basis. Santa isn’t going too kind in our house this year as I am waiting on disability and hubby is pulling all of the weight on his own. This would be a very nice Christmas gift! Oh cool!! I signed up for the email list. Thank you for the chance! A new Nana! I need to start quilting! This would be so much fun! I have wanted one for a couple of years, just haven’t been able to. I definitely need more sewing gadgets! One can never have enough. Discovering new gadgets is what makes sewing an adventure!!! I love stocking stuffers! Love the projects on your site! Love your blog and follow on Facebook! Accuquilt is an awesome site! Would love to win any items!!!! Love the blog and I follow you all on Facebook too. I have been a seamstress for 40 years and am starting into quilting. I haven’t completely converted over but I have been stock piling my fabric. I want to make one one for each child and grandchildren and a VERY SPECIAL ONE for my mother in memory of her family. She is being inducted as State Reagent for DAR in my State. Any quilting stuffers would help me out! I just started sewing and this would be perfect to get me going! Happy Holidays! I am an avid crafter, but am just starting to sew. I would love to win some tools and supplies to help me on my journey to quilting! I love all kinds of neat tools and I don’t have much quilting stuff yet. Thank you. I would really enjoy having a stocking filled with such goodies! Some are dreaming of a white Christmas, but I am dreaming of owning a GO. I have wanted one ever since I first saw a demonstration. I will keep dreaming. I love moda fabrics. They are my favorite. I love the layer cakes. I would love to win a prize of the day. I love a chance to win a go, looks like a lot of fun! I’m relatively new to quilting, my Grandmother passed away two years ago and ever since she passed away I have fallen in love with quilting and sewing, it was one of the things she taught me the basics of… I love to see the joy on my family’s faces when they see the talent I have been building, although being in college it’s sometimes tough to be able to get the things I would like for projects. Someday I hope to be able to be fortunate enough to be able to share my talents of quilting with people who are going through difficult times, and to win this would be a huge step toward being able to give my projects away to those who need them for difficult times! Why? Because there are so many quilts to make! Goody, Goody, Goody – what a neat bunch of Goodies! Hope I can win them. I would love to win a stocking stuffer full of goodies. I’m just getting into wanting to make homemade gifts and there are so many I want to do. This would be a great addition for some awesome gifts. Thanks for the giveaway. What an awesome stocking stuffer! How exciting! I would love to win this! So glad I found your site! Recently DH got me a fancy-schmancy sewing machine so now I need to learn to quilt! I love quilting, how about you? Would love to win this to expand my talents! Feel free to pick me for any of the giveaways! I’ve been pretty good and I can explain most of the naughty. It would be wonderful to receive these beauties in my stocking. Can’t wait to see who wins all the goodies. Thanks for the chance. This was so much fun seeing all the new things to me I’d never seen before and seeing some of my favorites again. Thank you for doing this. I would love a accuquilt. Chocolate too!!! Thank you Santa I promise I’ve been good. I would love to win! Thank you for the giveaway and have a wonderful holiday! Moda rocks! Love your fabric, and great ideas in the bake shop. Oh yeah winning would bee fun!!! Would love to win this prize package. My fav fabric line and good ways to use it! Would love, love , love this! I just became a follower. I would love to win this prize because I love stocking stuffers and yours are awesome! This would be AWESOME to win! Pick me, please. I thought I was a follower but I am now. Who couldn’t use new gadgets. A girl never has to many. Thanks for the lovely giveaway. would love to share the prize with my mom! What a fabulous giveaway! It is right at the top of my wish list. thank you for your generosity. Santa hasn’t been to my house in years, so this would be nice for him to leave this under my tree.